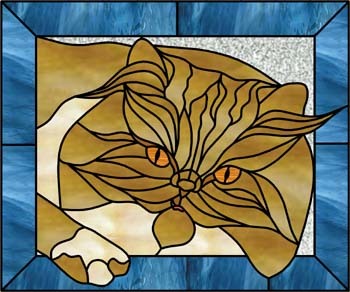 I sought out my first stained glass class in the mid-1990s, after buying my first house, which had painted "stained" glass in a pair of loft windows. I decided I would learn stained glass so I could put some REAL stained glass panels up there. After stumbling through the class, I was stymied by how messy the process is, and the fact that it utilizes some elements which, if not respected properly, are poisonous: lead and various noxious chemicals, not to mention constantly having invisible shards of glass imbedded in my fingertips. This put me off for a while, several years, in fact, but I could never stop thinking about stained glass, looking for it, and appreciating it. Early in 2002 I was playing around with a picture of my cousin's dog, Sam, in a Photoshop type program, and my first pattern was born. I literally gave blood, sweat, and tears to bring him to "life". This was a life-altering event for me, as I had finally found "the thing I'm supposed to be doing". I knew no matter how far I took my hobby that it is something I will do for the rest of my life, or at least as long as my hands and eyes still function well enough to allow me to cut glass! Then I found Glass Eye 2000, and after playing with the demo version I bought the Professional Edition before the demo even expired. What a joy to use! As I was already familiar with graphics programs, Glass Eye 2000 required virtually no learning curve at all. It beats any vector or bitmap based graphics package hands down, and is perfectly designed for its function. For the next few years I practiced my design and fabrication skills, excited that something I loved to do had the potential to provide income as well. Then, friends at work began commissioning pet panels as gifts for family members, and I knew I had a niche market as well. In spring of 2006, I decided to hang out my shingle and see if I could make a business of my glass work. I obtained all of the required licenses and permits, had spiffy new full color business cards printed, and punched up the website. I researched advertising options, and decided to go with one of the shared mailer packets everyone receives in the mail once a month. I received numerous responses immediately, and got several commissions right off the bat! I was greatly encouraged and happily delved into my work. 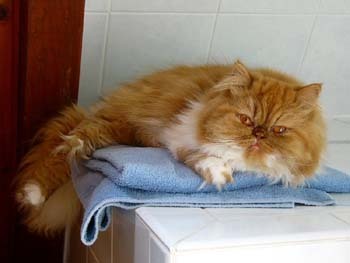 My first commission came from Karen and Michael, a wonderful couple with seven beautiful Persian cats. They wanted to have one of them created in stained glass, and as a result, "Maya" was conceived and constructed. Maya is one of those subjects that just begs to be created in glass, and virtually created herself. The decisions came automatically and with very little thought, and there were no revisions to the design by the customer. Construction of Maya was a breeze as well. My new customers are delighted with their piece of artwork, and Maya herself seems quite pleased, also. The very best part of this story is that they are now great friends. It never occurred to me that this would be a "side effect" of my business venture, but this aspect has turned out to be just as fulfilling as making the business itself a success. Christine Keller lives in Baltimore, and has been creating stained glass since 2001. 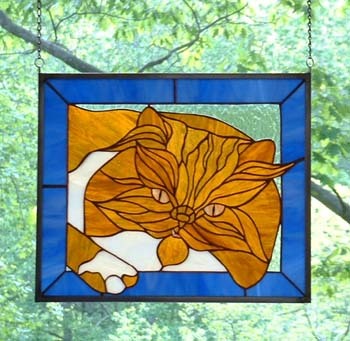 She learned early on that she prefers creating her own designs to using purchased patterns, and has found a niche designing pet portraits in stained glass. She's a computer geek by day, stained glass artist by night, and hopes someday that her glass will be sustaining full time. Visit her website or send her an email.